After the queue for a given semester is consolidated, PIs of approved proposals are sent a "Phase II skeleton", imported into the Observing Tool (OT) so that individual observations can be defined. 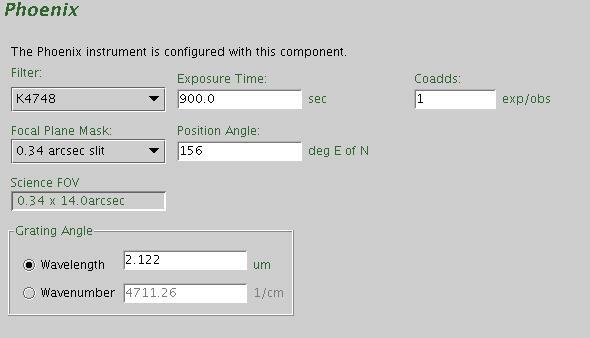 The Observing Constraints and Target coordinates are automatically imported from the Phase I proposal. 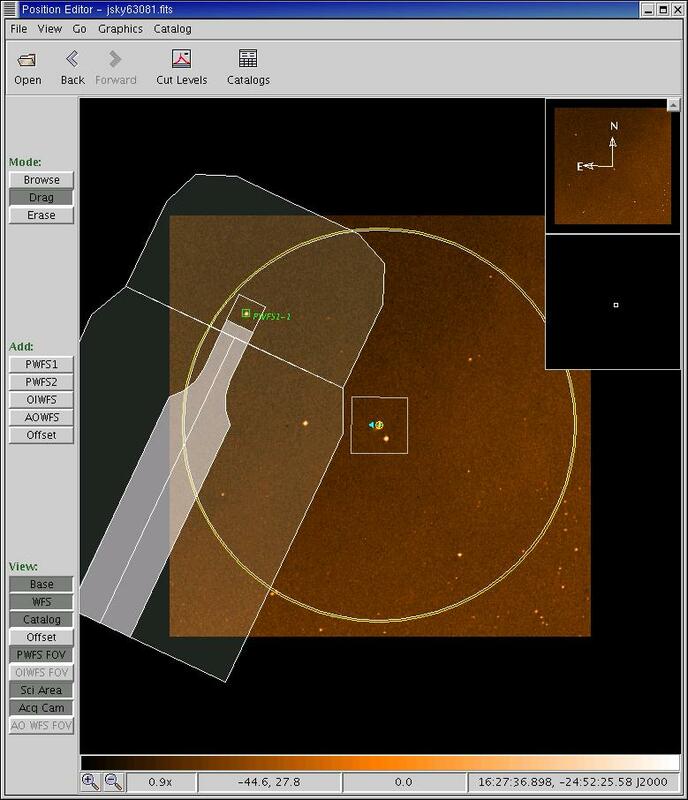 By selecting the Target tree branch and clicking on the Image button at the top of the page, the observer can access the Position Editor, which allows for interactively selecting WFS guide stars and defining the Position Angle of the slit (see below). 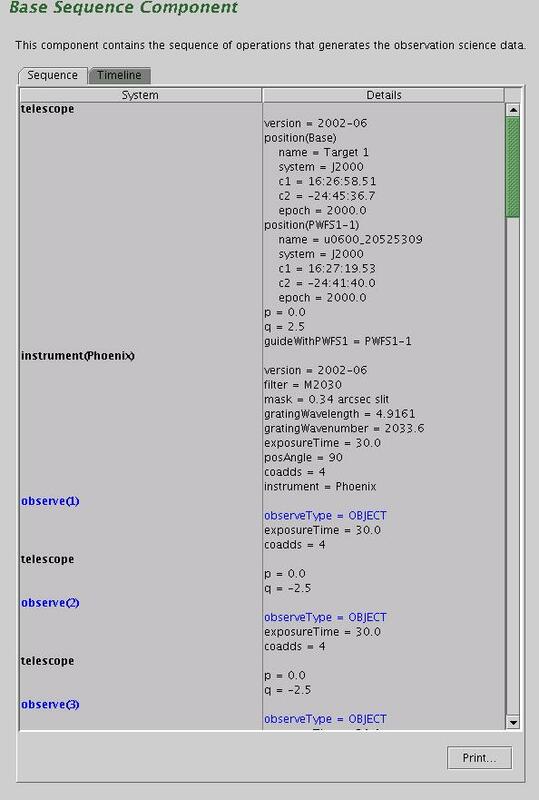 The Phoenix Component: The instrument configuration is defined here. The example below is for an observation in M band (4.9 µm), using the default exposure time of 30sec x 4 coadds at each offset (nod) position. 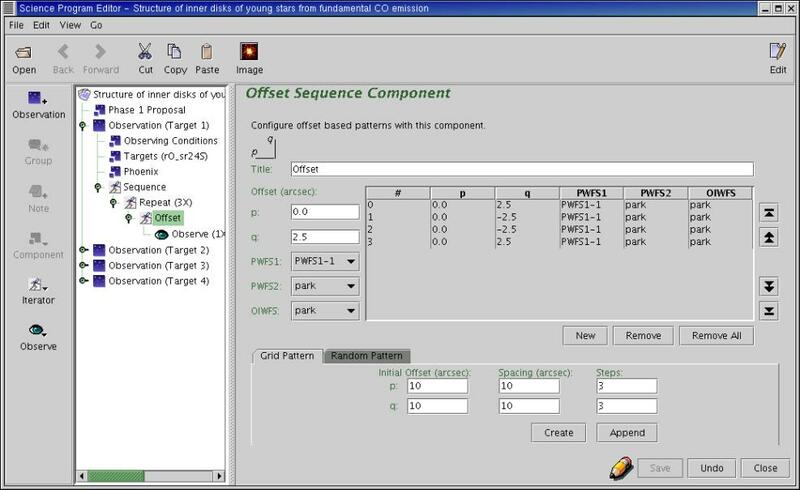 The Filter and Focal Plane Mask pull-down menus allow for choosing the appropriate order sorting filter and desired slit width. 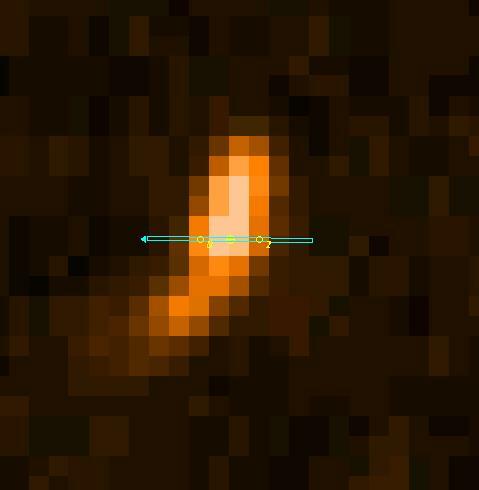 By default, the K4308 filter and the 0.34 arcsec slit are shown. The grating angle can be selected by inputting either the central wavelength (in air microns, µm) or wavenumber (in vacuum wavenumbers, /cm) The conversion is automatic between them. The default position angle for the Phoenix slit is 90 degrees (slit oriented E-W). 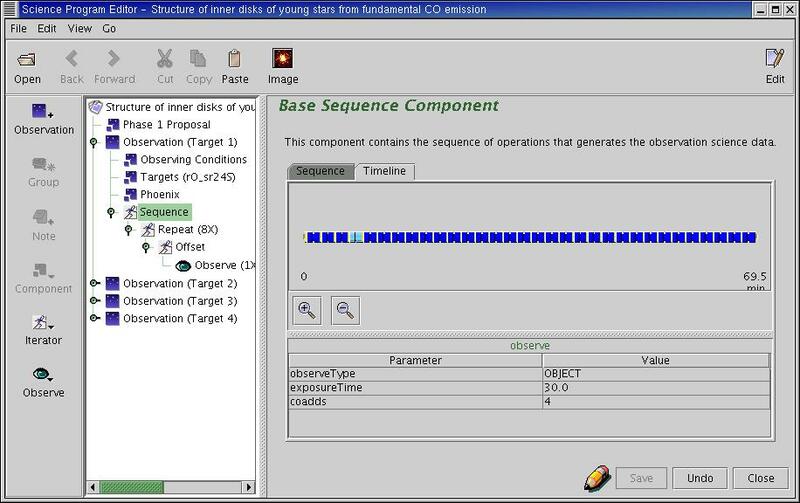 The Sequence Iterator: The image to the right corresponds to a zoom into the science FOV in the position editor and shows the offset pattern corresponding to a standard ABBA nod sequence along the slit, with 5 arcsec separation between the two positions. Unlike the facility instruments (GMOS, T-ReCS, etc. 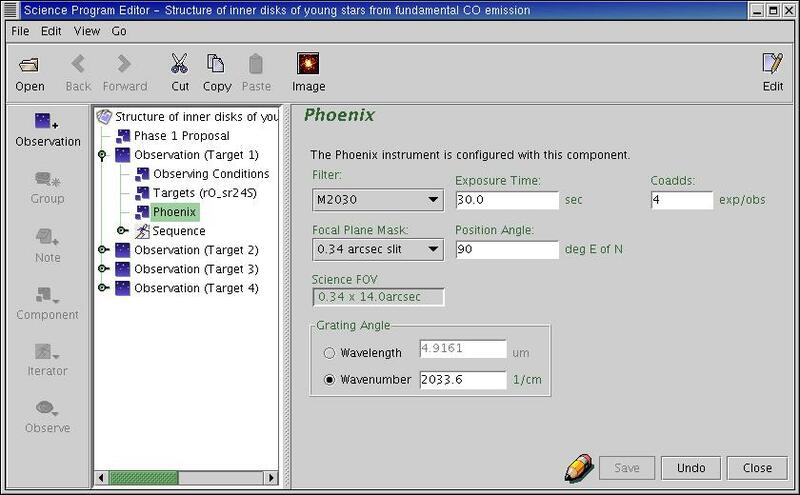 ), the Phoenix OT does not contain an instrument iterator, and therefore each grating setting has to be defined as a separate observation. The above example was constructed to result in a 64 min exposure on-source, consisting of 8 ABBA sequences (4 x 120sec each). 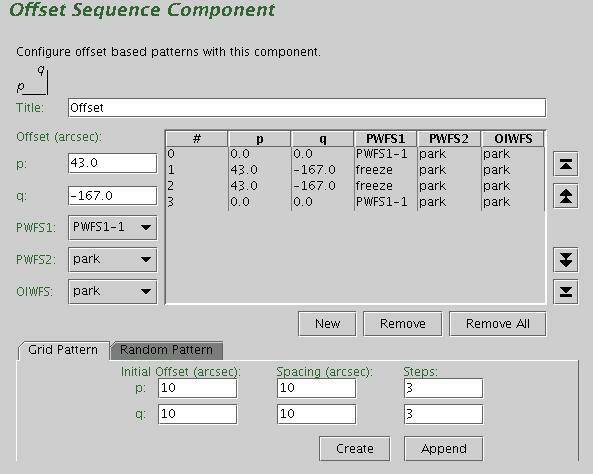 This is achieved by selecting the Sequence branch, and adding under it (from the Iterator menu to the left) first a Repeat, then an Offset layer: The actual offset (nod) pattern is defined by selecting the Offset branch, then adding four offset steps, 5 arcsec apart centered on the base position. The p-q coordinate system is fixed on the focal plane of the instrument and actually rotates with the PA selected in the "static" configuration. For Phoenix, the "q" axis is always oriented along the slit. 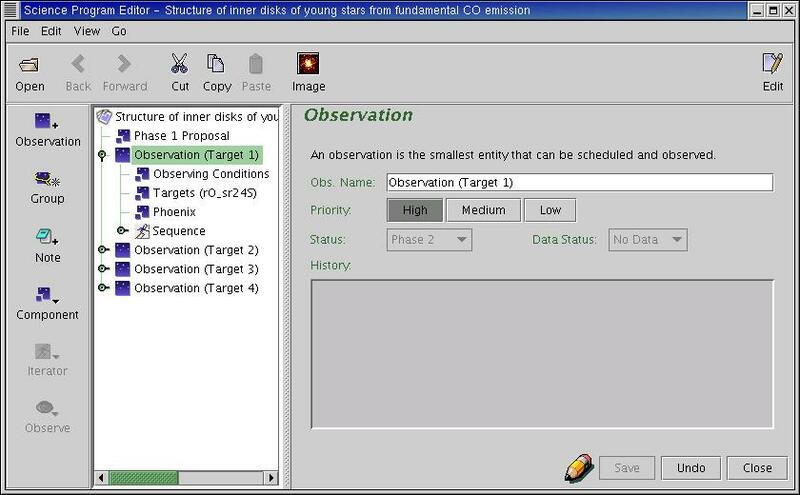 This example shows the telescope and instrument configuration blocks, then the first three steps of the actual observing sequence. 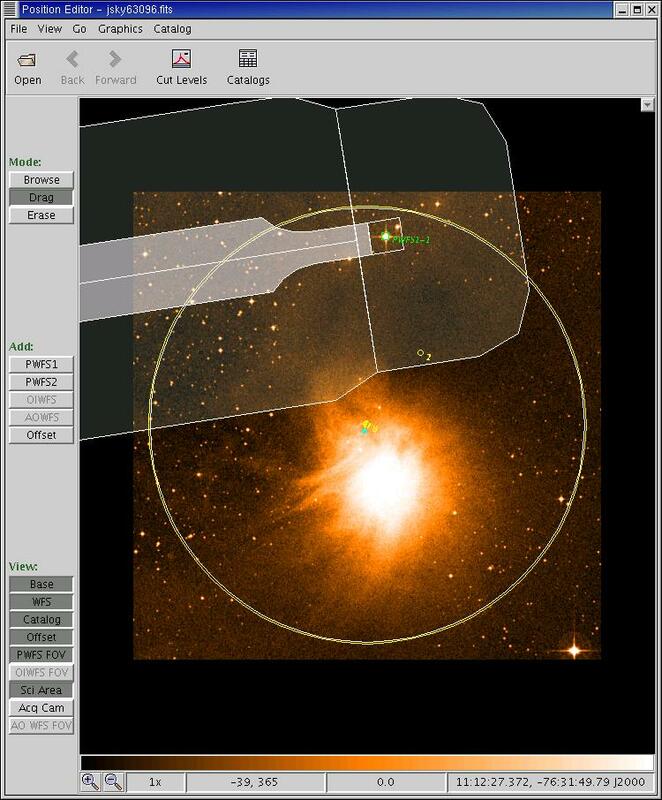 When observing extended objects, or emission lines from nebulae, it may be necessary to offset to a clear patch of sky. The example below is for a K band observation, 30 min on target (no coadds), centered on the H2 2.12 µm emission line, with the slit oriented along an arbitrary PA and a large offset to sky. The exposures are taken using one single ABBA sequence, but with the sky unguided (PWFS-2 set to "freeze" for the two sky positions). 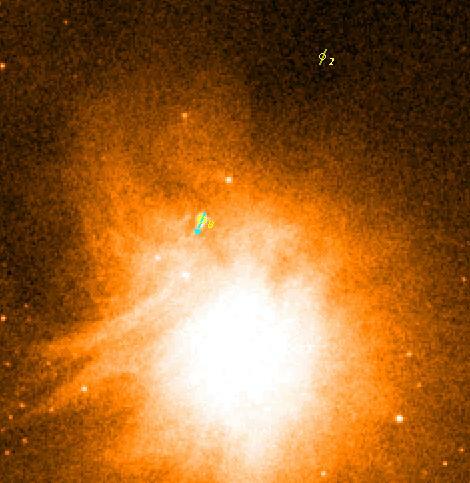 Note that with such a large offset, the guide star selected for the target cannot be used for the sky position (if a guided exposure was necessary) and would actually vignette the field if the WFS was left following.